You are here: Home / Interviews / From The Provost. 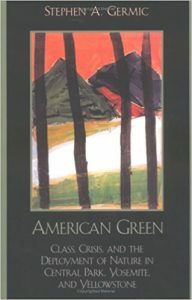 Dr. Stephen A. Germic is the Provost and Academic Vice President at Rocky Mountain College in Billings, Montana and the author of American Green: Class Crisis and the Deployment of Nature, a comparative study of the origins of national and urban parks. His creative non-fiction has been published in journals such as The Cape Rock, The Coe Review and The Carolina Quarterly and he is finishing work on a new poetry manuscript. Dr. Germic was one of my professors from my undergraduate years at Rocky Mountain College, and part of the reason I am pursuing an MFA in writing. He cultivated strengths in each individual student and inspired the classroom with lively discussions about craft and sentences. It was customary to follow him from a three-hour workshop class to the bar across the street for a pint or two — or three. Conversations with Dr. Germic could lead anywhere—from the intricacies of academia to sailing off the panhandle of Michigan—but they were always infused with his spirit. He taught me that sentence pacing is everything in prose, and it is evident in his work. The moment I stepped into his classroom at RMC to learn about a subject I didn’t know existed—creative non-fiction—he captured my attention. So, you can imagine my excitement to catch up with Steve when he agreed to an interview. After acquainting him with the snowy happenings of small-town Vermont, we got right to it. JW: How do you mitigate all the different responsibilities in your day-to-day life? From being a father to being a teacher, and a writer and administrator, it all seems to be a lot to balance. Germic: It’s tough. My daughter is away. In some ways that’s the saddest thing in my existence, but it allows me to be able to accomplish other things. If someone came up to me and looked at my life and said, “Hey, does this dude have good work/life balance?” They’d probably say, “No, not really.” On the other hand, I’d say, this is what I do. I come to the office in the morning by seven-thirty or eight o’clock, and I’m there until five or six o’clock, then I go home and I answer email and do work, or whatever class prep I need to do. That basically takes me until I need to go to bed. It isn’t until the weekend that I sit in the coffee shop for a couple of hours and work on my creative writing. So, I’m able to put in 4 or 5 hours a week on my own work. During the summer I get to do that four or five days a week, and double or triple my productivity. But during the year, I just can’t. That’s how my life rolls. That’s just what it is. But it’s tough, you know? The key to it is — and I did this when I was building my poetry manuscript — I had to get out of my house and get to a space where things are happening, where I was being stimulated—coffee shops, good libraries—and I would just sit there. I’d say, I’ve got to write a couple poems or I’ve got to write two pages, that’s just what I have to do. Half the time, the poems are alright and the prose pages generally work out, but it’s all about that discipline. It’s all about ratcheting in that time. You can’t sit around saying, “Oh, I’m not in the mood,” even though sometimes it’s inevitable. I’ll sit down, read, get a phrase or a line, and I’ll just leverage off of that. I’ll write that and build around it. It gets the language operating. I’ve always told students there’s never writer’s block because you can always sit down and describe. And if you’re writing a research paper, you can always quote the work that you’re writing about. You can say, I think this is important, then introduce the quote, then talk about it. All of a sudden, you’re writing. It might not be good, but you’re writing. JW: Are you working on any new projects right now? Germic: Yeah, I just wish I had more time. I started a novel about a month ago, and I’m fifteen pages in right now. My goal by the end of the semester is to get to fifty. It’s going to be rough, but I can get to 100 by the end of the summer. When I get to fifty pages, I’ll start marketing it around and see if I can find a buyer. Germic: Well… (laughs) it’s kind of hard to describe. A literary kind of fabulism, I suppose, would be the way to describe it. It’s a kind of mash-up of literary fantasy fiction. JW: Oh, I haven’t seen a lot of that out there. Germic: Yeah, there’s probably no market for it. JW: I also heard there might be a book of poems? Germic: Yeah, basically it’s done. The model is: finish your manuscript, then send it out to contests and hope you win. I have to put it up to one more edit, but I hope, by the end of the semester, to have it out under consideration at some places. It finished up as about a 65-page poetry manuscript. I will be shopping it around at the end of the term. (Chuckles) I’m guardedly optimistic. JW: When I’ve read your work, I’m always surprised by your descriptions of the natural world. What draws you toward this type of writing? Germic: For me, in creative writing it’s description. I have poems where I often count things, like four birds along the shore. For some reason, that works for me: describing the world I am inhabiting and hoping that, by the end, I’ve created something that has some resonance, some potential, or implicit metaphoric punch. JW: Who were some of your influences? Are you a Thoreau guy? Germic: I’ll tell you who I was more influenced by—a guy by the name of Jim Harrison. Not his prose, but his poetry. I don’t think he’s a great prose writer, but he’s a very good poet. He knew the world that he inhabited. He didn’t call something a tree or a bush. It was a scrub alder, or something like that. For me [writing] can’t be inward looking; it’s only inward looking by misdirection. I see the world out there. JW: In today’s difficult political climate, what do you think the role of a writer is? What can it be? Germic: For a few years of my life, the Poetry of Witness was important to me. Carolyn Forché is kind of the originator of that. 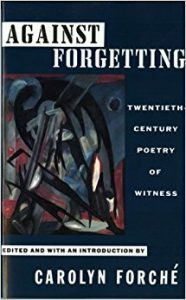 She put together this anthology called Against Forgetting, which was pretty important to me at a certain time. I’m not a political writer, even though if you read my academic work, I’m a Marxist. Or a critic. It’s what I do. In a way, my politics are so far left that where we are now doesn’t surprise me at all. I think we’ve allowed this to happen. People on the left have allowed it to happen, and I think that it needs to be a wake-up call. We can’t sit there and pretend that we did not ignore the problems that upset this world, problems that ultimately have to do with race and class. We are reaping what we have sown. Our job is to think, in really subtle ways, about that. I would say that anyone who wanted to think about “our moment”, should think about their own role in creating it. But to my mind, we’re just too delusional; too easy to blame other people for our current political situation. Those of us with liberal pretensions, we created this condition. We ignored the American underclass; we allowed this political and economic system to develop; we didn’t hold the previous administration accountable enough and this is what you end up with. JW: You’ve worked at a lot of universities — from Dubai to Michigan, and now in Billings, Montana. How would you say this track into academia has shaped you? Germic: I started at Michigan State then went to James Madison University, then American University in Cairo, then the American University in Dubai and now, to Rocky Mountain College. It’s funny—I left what was essentially a Dean position at the American University in Dubai. I moved steadily up the ranks as I moved around. I got run out of Michigan State and James Madison for what amounts to political activism, both in the larger global politics sense and in the micro-institutional politics sense. I just pissed off the wrong people and they made it clear that I didn’t have a future at those institutions. This, unfortunately, interrupted my research agenda. I was a fast-paced and productive research scholar until I went overseas and I no longer had access to my research materials. That’s when my career shifted to administration. I began doing some administration in Cairo, and then more in Dubai. I got disgusted and quit there. Then, I came here — never intending to get back into administration — and here I am, the Provost. JW: Provost and Academic Vice President. That’s a big title. How challenging has it been to adjust to these new responsibilities while also having a teaching career? Germic: I still teach a couple classes a semester. If my daughter was still around, there’s no way I would do it; I wouldn’t sacrifice that much. But she went off to college and I got divorced, so I’m a single dude now. I can put in a 12- or 14-hour day. I won’t give up teaching because it’s the most affirmative part of what I do. As long as I feel that I can meaningfully help this institution move to the next stage of its evolution; as long as I feel like I still have traction and we can push this place forward, then I feel really good about the work I’m doing here. When a pattern develops, when I feel like I can no longer do that, then it will be time to move on. https://hungermtn.org/wp-content/uploads/2017/04/coffee-shop-1200x800.jpeg 800 1200 Miciah Bay Gault https://hungermtn.org/wp-content/uploads/2019/03/Writing-and-Publishing-Logo-300x874px.png Miciah Bay Gault2017-04-13 09:00:542019-03-24 17:08:03From The Provost.